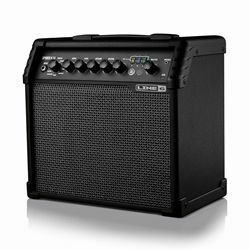 The Spider V 20 amp sounds great right out of the box, and its simple controls and convenient size make it an ideal practice amp for any guitarist. Select one of 16 presets, then use the interface to quickly tweak that tone to your preference. Each preset contains three effects that can be switched in and out stompbox-style using the FX buttons on the front panel. Turning the Reverb knob adds atmosphere and depth to your sound, and you can tap in delay times and modulation rates with the Tap/Tuner button. Plus, access the onboard tuner with the press of a button. Connect the Spider V 20 amp to your Mac or PC, or iOS and Android device with the micro USB port and edit your sound with the free Spider V Remote app, or record your performances with the included Steinberg Cubase LE DAW.